I got 3 estimates from 3 window companies for my 3-flat. Two gave me low prices, and then came the hidden charges. Varco Windows delivered what was quoted with no extra or hidden charges. I got quality windows, installation and service at the price I expected. In the future, I'll call Varco. Welcome to the VARCO Remodel and Replace Resource Center. On this page, you will find links to information that will help guide you through your window and door replacement project. For your convenience, we've also provided links to resources for other types of remodeling and home improvement projects. Please download our buying guide which illustrates all of the ins and outs of replacement window and door products. With today’s high-performance window technology, you can have a proven solution to resist the sun’s heat in the summer, and welcome it in the winter! There are energy-efficient windows on the market that are engineered to accommodate almost any budget, while providing the highest levels of year-round comfort and energy savings, making them well suited for virtually any climate. These high-performance windows are ‘Green’ because they use technology that helps lower your energy use. Lowering your energy use reduces air pollution, such as CO2, that is emitted from power plants, thereby making a greener environment for everyone. PVC (vinyl) frame materials can be considered ‘green’ because they are recyclable and have a sustainable lifespan, keeping them out of landfills. Today’s vinyl production is not petroleum-based. PVC production does not require burning or generate harmful gases. Once they are installed in your home, vinyl windows are environmentally friendly due to their maintenance-free composition; they never require painting, sanding or refinishing. Look for vinyl windows that are custom-made to fit the exact openings in your home, and ones that employ fusion-welded construction. Fusion welding prevents air leakage, water infiltration, and energy loss that are common with other frame materials on the market that are mechanically (screwed) or chemically (glued) fastened. Fusion welding also provides the best structural integrity. When replacing windows, look for double pane or triple pane windows. Just upgrading your single pane windows to double pane can improve the R-value, or insulating value by 200%. But, the greatest thermal improvement comes with the addition of low-emissivity coatings, insulating gases, and warm-edge technology. Low-emissivity coatings (Low-E) act like a filter. In summer, Low-E glass allows ample visible light to pass through while blocking infrared and ultraviolet radiant solar energy. The result — rooms stay cooler in the summer. In the winter months, the glass helps to keep rooms warmer by reflecting heat back into the home. Adding Low-E glass to your double pane windows improves the R-value by 300% over single pane glass. Air trapped between two or three panes of glass acts as an insulator. But for improved energy saving performance, the addition of Argon or Krypton gas to the air space provides greater insulating values. Argon and Krypton are non-toxic, odorless and colorless gases that create a thermal barrier between your home’s interior and the fluctuating conditions outside. Dual pane windows with Low-E glass and Argon gas provide four times the insulating value of single pane glass. 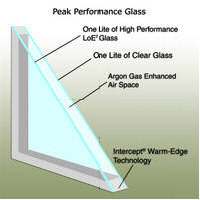 For the ultimate in energy saving performance, triple pane glass with Low-E and Krypton gas provides nine times the insulating performance of inefficient single pane glass. Also, look for windows that utilize warm-edge technology. Warm-edge spacer systems seal the insulating glass units and flex with the glass in hot or cold temperatures to help prevent seal failures. These insulating spacer systems also keep the edges of the glass warmer, dramatically reducing condensation while keep warm air in and cold air out. Did you know that you can completely transform the look of your home just by choosing different window shapes and styles when replacing your current windows? You can choose from our assortment of V-Bow, Flanker, Oriel and Picture Windows. To brighten a dark room, you can add our Wall of Windows to give you that great outdoors feel! Our vinyl replacement window styles can offer your home a unique new look, or accommodate any special architectural requirements your home may have. A V-Bow is an exclusive vinyl replacement window design from Thermal Industries consisting of two casement windows extending from a wood surround. 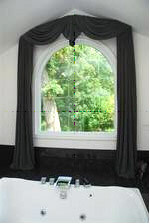 A V-Bow often used when a homeowner would like to have the light and space a bay or bow provides, but do not have the space in the window opening for these larger designs. Picture Windows have fixed sashes that do not open or close and may be used as the focal point in a room, or accent to other window styles. A window unit placed along side of another unit. A picture window may be flanked by a double hung on each side, or casements. Picture windows, casements and awnings can be stacked or flanked to create a wall of windows that maximize light and your view. 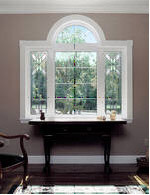 An Oriel window is a double hung window that has a meeting rail located off center of the frame. Most oriel windows have a 60/40 configuration. Download our Operating & Cleaning Manual. Insulating glass can be cleaned with any non-abrasive glass cleaner and soft cloth. the inner surface of the insulating glass unit and therefore, cannot be scratched. Etched, jewel cut, and glass units with caming can be cleaned with any non-abrasive, mild cleaner and a soft cloth (without loose strings or edges that can catch/loosen the caming). Use of abrasive or caustic cleaners will void the warranty. Also, care must be taken not to use any type of scraping instrument on or around your camed glass unit, as it may delaminate. The lead came option uses 100% lead came, which will form a protective oxidation when exposed to the environment. You should not attempt to remove this coating. The brass came option uses a real brass cap over the came body, and can tarnish. It can be carefully polished with commercially available brass polishes such as Brasso®. Take care not to get excessive polish on the glass, and remove any polish on the glass. Window and door hardware can be cleaned with any non-abrasive, mild cleaner and soft cloth. 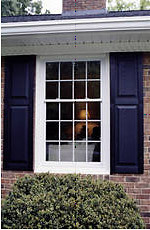 Vinyl windows and doors come closer to being maintenance-free than most exterior building products. They may become dirty just as does a freshly painted house, a new automobile, or any other product that is exposed to atmospheric conditions. With very little effort, you can keep your vinyl window and door frames clean. In most cases, a heavy rain is sufficient to clean these products. DO NOT wash windows with a high pressure spray. If rain does not do a satisfactory job, follow these simple instructions. These instructions are based on a study conducted by the Vinyl Window and Door Institute on the efficiency of cleaning agents and their effects on the appearance of vinyl window frames after two years of outdoor exposure. Wash using a soft cloth or ordinary long-handled soft bristle brush. For difficult-to-remove dirt and stains such as top soil, motor oil, lithium grease, crayon, felt-tip pen, caulking, lipstick, grass, bubble gum, mold and mildew, use the readily available household cleaners listed on the following page. Follow manufacturer’s instructions on use of cleaners. In some cases, you may wish to use a mildly abrasive cleaner, such as Soft Scrub®, Ajax®, Bon Ami®, etc., but the use of any abrasive material could have a negative effect on the glass surface and window or door frames. DO NOT use any type of abrasive cleaners or Brillo Pads on DreamWood, Natural Wood Grain, or Honey/Caramel Oak Woodgrain Finishes. Do not use cleaners containing aggressive organic solvents because they could affect the surface appearance of the vinyl. Examples of such cleaners are: chlorine bleach, liquid grease remover, strong soaps and detergents containing organic solvents, nail polish remover and furniture polish/cleaner. For Natural Woodgrain Interior Laminate, and Honey/Caramel Laminate Woodgrain Finishes, use mild household cleaners from suggested list. DO NOT use harsh abrasive cleaners or Brillo Pads on these surfaces. Use a Mr. Clean® Magic Eraser® on the Honey/ Caramel Oak laminate surfaces for hard to clean areas. DO NOT use Magic Eraser® on Natural WoodGrain surfaces. NOTE: VARCO does not endorse proprietary products or processes and makes no warranties for the products referenced herein. References to proprietary names is for illustrative purposes only and is not intended to imply that there are not equally effective alternatives. The installation of your new windows has made your home more air-tight and energy efficient. Over the years, you will save considerable energy dollars and enjoy a more comfortable living environment as a result of your investment. Now that your house is more air-tight, moisture created by everyday activities (cooking, bathing, laundry, etc.) is no longer escaping through the drafty holes and cracks of your old windows. This moisture, now trapped in your home, looks for a place to rest/collect. Most often this moisture or "condensation" collects on your windows. It is important to understand that windows do not cause condensation; they simply reflect a condition in the home. Condensation is an indication of too much moisture in the air which manifests itself on the glass surface in three ways; (1) fogging, (2) droplets, (3) ice. A little condensation is quite normal, and moisture can add to the comfort of an extremely dry home. However, excessive condensation can cause damage to paint, wallpaper and plaster if not controlled. The good news is, condensation can be controlled by reducing the sources of humidity within your home to an acceptable level of comfort. During the spring, summer and fall seasons, when warm days are followed by cool nights, moisture may collect on the outside pane of glass on your windows. This collection of droplets is called dew, and is the same type of condensation you may see on your car windshield or lawn in the morning. Insulating glass units utilizing high-performance glass systems, such as Peak and Super Peak Performance™ Glass, are designed to reduce the amount of heat that flows from the inside of your home, to the outside of your home, during colder weather. By keeping more heat inside your home, the outside surface of the insulating glass unit stays colder. When the glass surface of your windows falls below the dew point (that's when water vapor in the air begins to condense), condensation forms on the outside glass surface. Therefore, if you see condensation on the outside of your windows, this is visible evidence that your energy is being saved, and that your window investment is paying off. Shut off furnace humidifier and any other humidifying device in your home until condensation subsides. Be sure that louvers in the attic or basement crawl spaces are open and that they are large enough to allow adequate air flow. Run kitchen or other ventilating fans while cooking. Run exhaust fans while showering and keep bathroom door closed. Do not hang full loads of wet laundry inside your home to dry during the heating season. Vent clothes dryer to the outdoors. Open a window and air out your house for a few minutes each day. If troublesome condensation persists, see your heating contractor about an outside air intake for your furnace. NOTE: Condensation on glass is a natural result of excess moisture in the house and does not indicate a defective product or faulty installation. Maintaining proper household humidity levels may prevent problems such as mold, mildew and related health issues. In no event shall VARCO be liable for any damages including special, incidental or consequential damages resulting from condensation, mold or mildew. If you become aware of persistent condensation on your windows, you should take immediate remedial action to prevent water, mold and/or mildew damage to your property and to avoid potential health risks. Additional information is available upon request. The National Safety Council (NSC) and top fenestration industry organizations have declared the first full week of April every year as National Window Safety Week, which is timed to coincide with spring the time of year when homeowners are again opening their windows. This year, National Window Safety Week is April 1-7, 2012. Learn more by visiting the NSC Web site. Fires and falls of all kinds are among the leading causes of injury and death in young children. While some falls occur from windows, it is important to realize that in the event of a fire, a window can also save a child's life. This is why windows play a critical role in home safety. Print out this checklist from the National Safety Council and use these tips to help keep your family safe around the windows and patio doors in your home. Has your family developed an emergency fire escape plan? Determine your family's emergency escape plan and practice it regularly. In the plan, include two avenues of escape from every room. Remember, children may have to rely on a window to escape a fire. Help them learn to safely use a window under these circumstances. Make sure you have identified a safe meeting place outside. Do you keep windows shut when children are around? You should keep your windows closed and locked when children are around. When opening windows for ventilation, open windows that children cannot reach. Also, set and enforce rules about keeping children's play away from windows and/or patio doors. Falling through the glass can be fatal or cause a serious injury. Do you leave, or have you left, windows open because you thought the insect screen provided a safeguard from a fall? Don't rely on insect screens to prevent a fall. Insect screens are designed to provide ventilation while keeping insects out; they are not designed to, nor will they prevent a child's fall from a window. Is there furniture placed under or near windows in your home? Keep furniture, or anything children can climb, away from windows. Children may use such objects as a climbing aid. Do you have any window unit air conditioners in bedroom windows or other windows in your home that may be needed for escape or rescue in an emergency? Do not install window unit air conditioners in windows that may be needed for escape or rescue in an emergency. The air conditioning unit could block or impede escape through the window. Always be sure that you have at least one window in each sleeping and living area that meets escape and rescue requirements. Recent fatal fires in high-rise structures have prompted American to rethink fire safety. A key to fire safety for those who live and work in these special structures is to practice specific high-rise fire safety and prevention behaviors. Do Not Panic in the Event of a High-Rise Fire Emergency. Before you try to leave your apartment or office, feel the door with the back of your hand. If the door feels warm to the touch, do not attempt to open it. Stay in your apartment of office. Be patient. Rescuing all the occupants of a high-rise buidling can take several hours. No matter where you live, always install smoke alarms on every level of you home. Test them monthly and change the batteries at least once a year. Remember, fire safety is your personal responsibility...Fire Stops With You! ©2012-2019 VARCO Windows & Doors Inc.